As noted previously, response to the proposal to extend the Fortis gas main into the Sage Mesa and Husula neighborhoods has been mixed. What we are seeing in our informal straw poll and other feedback is residents with very high electrical costs who want access to natural gas and other residents who are happy with the status quo. This is especially so in Sage Mesa, where many of the houses do not have ducts. Such a split in opinion is problematic given the RDOS’s preferred approach, which is to make the decision on a neighborhood-by-neighborhood basis. Those who opt-in pay enough to fund construction of the main extension in their neighborhood. That is, the overall lump sum payment to Fortis remains the same. It is just paid by fewer property owners. Those who opt-out pay nothing, even though the gas main is installed in the road in front of their property. The RDOS keeps a record of who has opted-in and who has opted out. If an opted-out property wants to connect to natural gas they must arrange for connection with Fortis but must also petition the RDOS to “buy-in” to the service area and pay a specified latecomer’s fee. The funds collected from any latecomer’s fee are paid back to those who originally opted-in. To be clear, these refunds are paid to a street address, not a person. If you opt-in but then move away the RDOS does not track you down and pay you back. The decision for the RDOS whether to go forward for Sage Mesa and/or Husula Highlands thus boils down to the “willingness-to-pay” of those who want the service. This is something we have to assess carefully. To this end, we will be mailing you a survey that asks you whether you are willing to join the gas service in your neighborhood over a range of price/opt-in scenarios. Some opt-in/price scenarios are shown below. The first table is total (lump sum) cost per property and the second table is an estimate of annual cost per household for those who choose not to pay a lump sum. In the survey you will be asked if you are willing to opt-in at each price level. To illustrate how this might work, consider the prices for the 25% opt-in level below. If only 25% of residents in Sage Mesa opt-in to the service then the cost per household (of the gas main extension only) would be approximately $7,400. This relatively large contribution by a relatively small number of residents would be enough to permit Fortis to install the gas main extension down every street in Sage Mesa. Of course, the RDOS offers residents the ability to pay this charge over time on their tax bill. The 25% opt-in price works out to about $958 per year over 10 years (the annual payment would drop to about $600 if we decided instead to amortize the costs over 20 years). This assumes an interest rate of 5%. The Municipal Finance Authority interest rate is generally well below the market rate we would see as consumers. 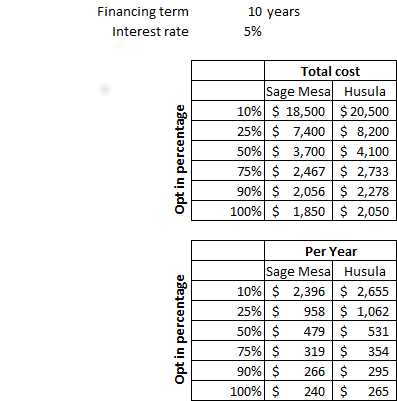 The critical question is thus the following: Are 25% of Sage Mesa residents willing to opt-in at this price? If the proportion is at least 25% we can move forward. If not, we cannot. Of course, as the adoption rate climbs the price drops. Say only 10% of residents report a willingness to opt-in at the 25% opt-in price. This means the project is not viable at that price. However, if 75% of residents report being willing to opt-in at the 50% price (about $479/household/year), the project would be feasible. Moreover, the price for the 75% opt-in level is only $319 per household per year. This process of checking each price against the reported opt-in rate at that price continues the lowest feasible price is found. Naturally, the best-case 100% opt-in level brings us back to the pricing used at the public meeting. But I sense we will fall short of 100% opt-in in either neighborhood. Note who is bearing the financial risk in this approach: The residents who opt-in are saying—in effect—that natural gas is so important to them that they are willing to fund infrastructure for their entire neighborhood. Given the current difference between natural gas and electricity prices, this may make perfect sense for some residents. It all depends on your particular situation and the size of your electrical bills. In addition, those who opt-in might reasonably expect to get some of their money back if and when their neighbors opt-in. This might happen, for example, a few years down the road when a house changes hands and the new owner wants to connect to natural gas. Latecomer agreements are common in local government and are determined by processes specified by the province. Governments do not try to make money (and certainly do not try to lose money) on latecomer fees. Every attempt is made to set a fair price given significant uncertainty about the future. The person who buys your house (when you sell it) will likely know whether you are in or out of the service area and whether the opt-in fee has been pre-paid or financed. That is, by opting-out or opting-in but choosing to finance the fee you may think you are saving money. However, the buyer may demand that this amount be taken off the house price when you sell. We have seen some of this recently with the West Bench water system. Having said that, I personally would finance the full amount. The amount and timing of future latecomer rebates are very uncertain. All this is just meant as a heads-up. RDOS staff is looking into the details and confirming this approach is feasible. Please let me know if you have any questions or concerns. You are also encouraged to post your thoughts below using the comment feature. As one resident as reminded me, an advantage of opting-in early is that the RDOS can likely coordinate some economies of scale when it comes to residential connections. Recall that each household has connect to the gas main extension in the road. Although Fortis will do this for you (for a fee) it may be cheaper, especially in Husula, to seek bids from local excavation contractors to do many houses at once. Latecomers would, of course, miss this opportunity.